With the month of May right around the corner (where did the time go? ), I’ve got my mind on easy breezy wardrobe pieces for summer. I am totally smitten with latest styles by Lemlem. Founded by supermodel and Goodwill Ambassador Liya Kebede, Lemlem employs local artisans in Kebede’s home country of Ethiopia to produce the handmade goods. The collection includes dresses, ponchos, scarves, and shirts – all made from completely sustainable materials. (There’s even an adorable collection of children’s clothing as well!) 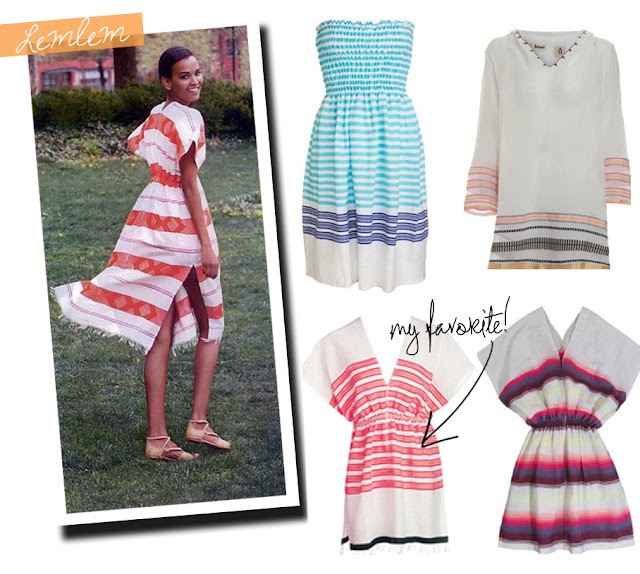 I adore all of the bright colors, and the lightweight, gauzy fabric will be perfect for hot summer days. I have fallen in love with this line!!! These are lovely- thanks for the intro!!! These are so pretty! The stripes are right up my alley! Perfect for summer! I love how Liya wears them at that “off” length- makes them unique.